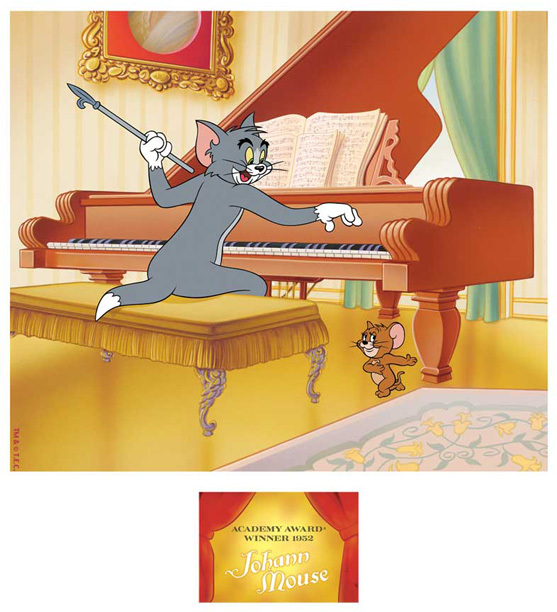 “Award Winning Series: Johann Mouse” takes place in Austria inside the home of composer Johann Strauss. “Johann Mouse” earned the Academy Award for Best Short Subject Cartoon, marking the seventh and final Oscar in ten years awarded to Tom and Jerry under the direction of legends Bill Hanna and Joe Barbera. Originally drawn by Vince Mussachia and inked by Laurie Dindis, “Johann Mouse” was then silk-screened onto acetate with the Clampett seal of authenticity. Each cel was then hand painted, while the background by Hector Martinez, was reproduced using the fine art Giclee method. Each piece is signed by Joe Barbera. Bill Hanna, who passed away in 2001, is paid tribute with his signature silkscreened in gold on the cel.